On November 30th of 2015, 56-year-old Tom Campbell was homeless and hoping to spend the coming sub-20-degree night at Lane Community College's Egan Warming Center, when he learned that the center would not open that evening, due to a shortage of volunteer helpers. "Someone had stolen all my possessions, all my gear," says Campbell, who instead spent the night sitting on a five-gallon bucket outside Bring Recycling in Glenwood. "The ladies who came to work at 7am gave me a blanket and called an ambulance. I had frostbite." Six months later, the toes on his right foot were amputated. A year later, both feet are still swollen and infected. "That's part of the reason that I volunteer at the warming center now," he says. "I'm also a consumer of social services, and I need to pay some of that back." The son of a Forest Service worker, Campbell was born in Corvallis and went to junior high and high school in Cottage Grove. He studied at a Southern California trade school and worked for nearly two decades as a motorcycle mechanic. In the early 90s, he studied computer science at Lane Community College and began volunteering at White Bird Clinic, serving people in need. He went to paramedic school and worked as a medic for White Bird, until his certification was revoked due to a number of driving while suspended violations. He went four years homeless in the late 90s, then found work as a bar-back and also took up videography, making DVDs for local bands and music venues. 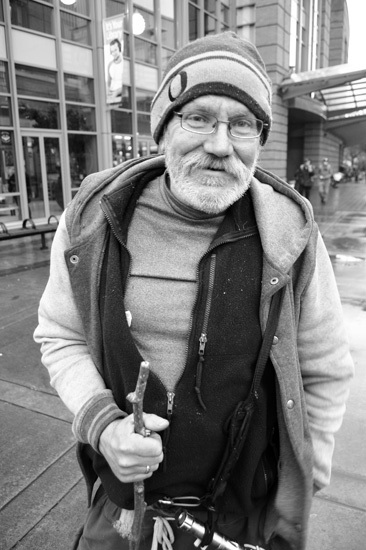 His current bout with homelessness began two years ago. He can be found volunteering at LCC's Warming Center on freezing nights from 2 am to 7 am in Building 4, room 104 on LCC's main campus. To learn more about becoming an Egan volunteer or to donate to the program, go to eganwarmingcenter.com.